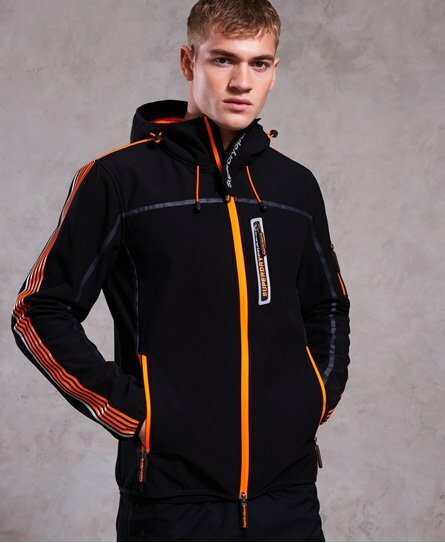 Superdry men’s Polar Team Sport Trakker jacket. This jacket is fleece lined and has thermal properties, making it perfect to wear pre and post workout. The Polar Team Sport Trakker jacket has elasticated cuffs, a bungee cord adjustable hood, three secure front zip pockets and one zip fastened arm pocket, ideal for keeping your valuables safe. This jacket also has ventilation detailing and reflective properties and is finished with stripe detailing on the shoulder and Superdry Sport logos on the zip pulls, collar and arm.